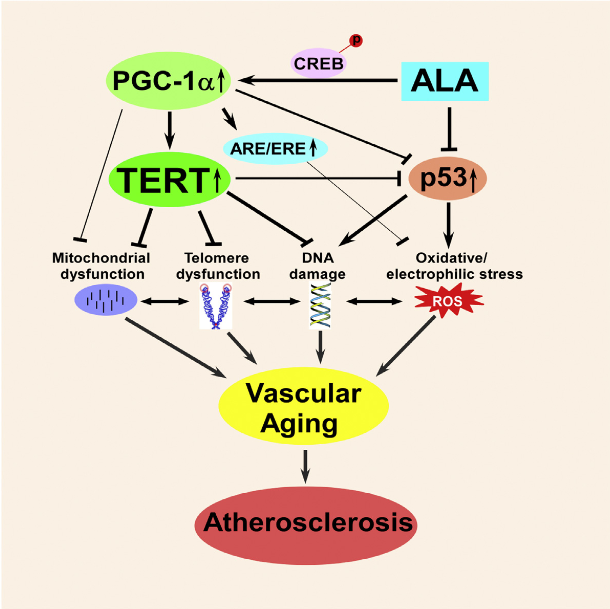 Researchers use dietary supplement in atherosclerotic mice to lengthen telomeres. In human cells, shortened telomeres, the protective caps at the ends of chromosomes, are both a sign of aging and contribute to it. The effects of chronic diseases such as atherosclerosis and diabetes on blood vessels can be traced back to telomere shortening. This means that treatments that can restore healthy telomeres have great potential. Now, researchers at Emory University have found that the dietary supplement alpha lipoic acid (ALA) can stimulate telomerase, the enzyme that lengthens telomeres, with positive effects in a mouse model of atherosclerosis. The team state that their discovery highlights a potential avenue for the treatment for chronic diseases. The opensource study is published in the journal Cell Reports. Previous studies show that alpha-lipoic acid has an essential role in mitochondria, the energy-generating elements of the cell. It is widely available and has been called a ‘natural antioxidant’. Yet ALA’s effects in human clinical studies have been a mixed bag. The new study found that ALA appears to exert its effects against atherosclerosis by spurring the smooth muscle cells that surround blood vessels to make PGC1 (peroxisome proliferator-activated receptor gamma co-activator 1)-alpha. PGC1-alpha was already well known to scientists as controlling several aspects of how skeletal muscles respond to exercise. While the current study did not directly assess the effects of exercise in their experiments, the findings provide molecular clues as to how exercise might slow the effects of aging or chronic disease in some cell types. The researchers state that what they show is that PGC1-alpha is regulating telomerase, and that has real beneficial effects on cellular stress in a mouse model of atherosclerosis. The current study used a model of atherosclerosis where mice lacked the ApoE cholesterol processing gene and were fed a high-fat diet. In this model, mice also lacking PGC1-alpha have more advanced plaques in their blood vessels, but only in older animals, the authors show. Data findings showed that consistent with the poorer state of their blood vessels, aortic cells from PGC1-alpha-disrupted mice had shorter telomeres and reduced telomerase activity. Results showed that having shortened telomeres led the smooth muscle cells to display more oxidative stress and damage to the rest of their DNA. The lab then went on to show that introducing PGC1-alpha back into vascular smooth muscle cells lacking that gene with a gene-therapy adenovirus could restore telomerase activity and lengthen the cells’ telomeres. The team explain that telomerase is off in most healthy cell types and only becomes turned on when cells proliferate. They go on to add that because telomerase is active in cancer cells and enables their continued growth, past studies have been concerned that stimulating telomerase in all cells might encourage cancer growth or have other adverse effects. As a way to boost PGC1-alpha in cells more conveniently, the lab turned to alpha lipoic acid or ALA. ALA is a sulfur-containing fatty acid used to treat diabetic neuropathy in Germany, and has previously been shown to combat atherosclerosis in animal models. The results show that treating isolated smooth muscle cells with ALA for one day could both stimulate PGC1-alpha and telomerase. Findings show that ALA’s effects on vascular smooth muscle cells could also be seen when it was injected into mice. The team note that they have not observed increased cancers in ALA-treated mice and stress that more thorough investigation is needed to fully assess cancer risk. The group surmise that while ALA is present in many foods and its effects in animal models look promising, it may be problematic for clinical use because of its poor solubility, stability and bioavailability. Currently they are designing new ways to formulate and deliver ALA-related compounds to resolve these issues. For the future the researchers are now investigating the effects of ALA on other tissues in mice. Cellular senescence and organismal aging predispose age-related chronic diseases, such as neurodegenerative, metabolic, and cardiovascular disorders. These diseases emerge coincidently from elevated oxidative/electrophilic stress, inflammation, mitochondrial dysfunction, DNA damage, and telomere dysfunction and shortening. Mechanistic linkages are incompletely understood. Here, we show that ablation of peroxisome proliferator-activated receptor γ coactivator-1α (PGC-1α) accelerates vascular aging and atherosclerosis, coinciding with telomere dysfunction and shortening and DNA damage. PGC-1α deletion reduces expression and activity of telomerase reverse transcriptase (TERT) and increases p53 levels. Ectopic expression of PGC-1α coactivates TERT transcription and reverses telomere malfunction and DNA damage. Furthermore, alpha lipoic acid (ALA), a non-dispensable mitochondrial cofactor, upregulates PGC-1α-dependent TERT and the cytoprotective Nrf-2-mediated antioxidant/electrophile-responsive element (ARE/ERE) signaling cascades, and counteracts high-fat-diet-induced, age-dependent arteriopathy. These results illustrate the pivotal importance of PGC-1α in ameliorating senescence, aging, and associated chronic diseases, and may inform novel therapeutic approaches involving electrophilic specificity. PGC-1α Modulates Telomere Function and DNA Damage in Protecting against Aging-Related Chronic Diseases. Alexander et al 2015.